Life has thrown some punches my way as of recent. I am cleaning up the mess these punches have made in my life and plan on getting back to blogging regularly again soon. Without to much elaboration let’s just say two days ago something life changing happened. It was/is a negative thing and that I am struggling to find the positive in. This afternoon I took in my lab coat for work. It is a size large…however in my weight loss it looked more like a cape on me. So I took it is on both the left and right side by 2 inches. It is not perfect however I am thrilled with it. It no longer looks too big. And I just finished making a tangerine solid perfume. It smells so good in here right now. The best part is that it only calls for the ingredients (Sweet Almond Oil, Essential Oil and Beeswax). Hope your making the most of this Beautiful Saturday! I have been busy the last few weeks….haven’t we all! I am hoping to get back into blogging in the next week or so. I know I need to update on the sewing gifts I received a couple weeks ago and would like to post a couple recipes I have made recently along with crafting update. As always enjoy what the days brings you! I have decided that in 2014 I will learn how to crochet and how to tatt. I purchased a book that I am thinking will help. However, I will take an suggestions or advice you have to offer! My Gram taught me how to crochet as a young child but I never kept at it. I have some of the yarn she had and would LOVE to make something with her yarn. My eyes are getting misty just writing about this…….Okay all better now. So where was I….oh yeah. I was wondering what would be a good beginner project? I do not make to make dish cloths or socks. Tatting is a lost art these days and is absolutely beautiful. I would like to at least try. What could hurt in trying? Infinity Scarf recipient was extremely happy. I received random hugs throughout the day as she was so thankful. The frustrations I felt while making it melted away as soon as I saw the look on her face. She said I should make them to sell and I immediately said no. As I have learned making something for an order is too stressful for me. Confession: I told her that the wavy part was the past on the scarf that lays on the back of your neck. She thought it was so sweet I marked the back of the scarf for her! Guess my mistake worked out for the best after all. My secret santa gave me 2 pair of fuzzy socks, a bobbin holder, a snowflake mug and a $50 gift card to JoAnn’ s. She went way over the budget but I am thrilled with what I received. The mug was so sweet of her…..I started drinking Lavender Tea and had mentioned in passing that I should get a mug that is white on the inside so I could appreciate the pretty purple color. I am one lucky lady! Here is a picture showing the wonky part (where the fabric is rippled) because the stitches are on the outside…it is the part of the scarf that will be behind the neck. I was thinking that this could be a good thing. Why? To the let the wearer know where the seam is so she can always position it in the back. 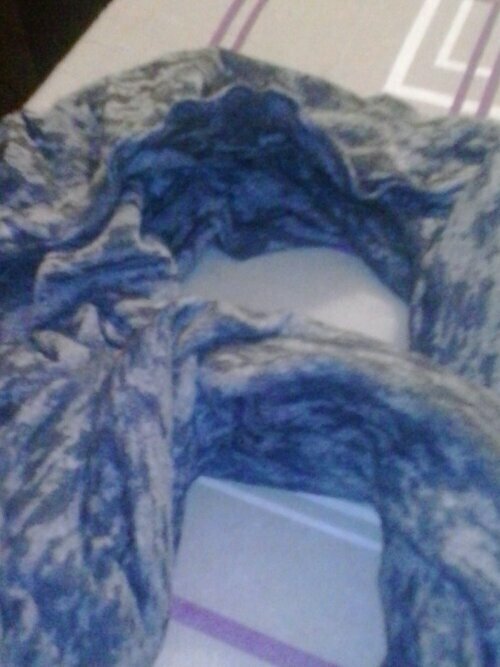 The finished scarf….what do you think? I have been working on making an Infinity Scarf. Or so I thought. Last night I modeled it for My Love…he gave rave reviews. I liked the softness of the fabric against my skin. 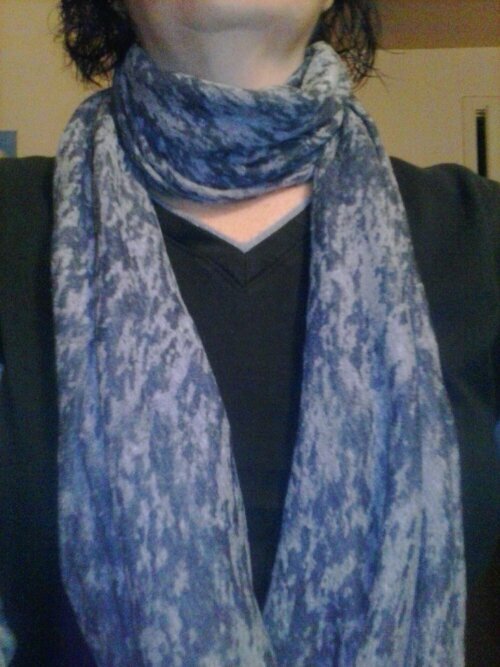 Upon looking in the mirror I almost wanted to make one for myself….but I am not a scarf wearing woman. However, this morning it occurred to me that a infinity scarf should be a round loop. Hmmmm mine was not. So off to the bookmarked pattern and a you tube video. After undoing ALL of last night’s work I once again began making an Infinity Scarf. I get to the last step when I hear the following dreaded words: Hand sew the opening…my hand sewing looks worse than a 5 year olds. So I rip all the work I had done and head to my machine.Yes the stitches are visible but who cares (I keep repeating these last three words to myself in hopes that I start to believe them). I showed it to a friend and she says so what….who’s going to notice. This is a Secret Santa gift for a co-worker. I guess I am just nervous about whether she will like it or not. People like handmade things right? Should I just have bought her one? Well she like the fabric I chose? Why am I making myself anxious about this? Ugh Thursday can not come quick enough (that is when we exchange). Enjoy what today brings you!